In the words of Greek philosopher Heraclitus — the only thing that is constant is change. Transitions can be difficult for us humans because our brains aren’t capable of processing everything on its own which can cause all kinds of emotional responses — some outward, but many hidden beneath the surface. Dealing with a breast cancer diagnosis can cause serious anxiety and other emotions since there are so many aspects of one's identity that come into question. And whether we like it or not, the only way to truly process our emotions is to confront them. As part of our holistic healing program, Aesthetic Plastic Surgery, PC taps into the power of empathy to help patients and their families confront their emotions together…at their own speed. The Patient Empowerment Program provides our patients and their loved ones with an open-ended support system. Since we all process emotions differently, our doctors want to make sure all their patients have every opportunity to get the necessary support before, during and after their breast surgeries and breast reconstruction. The benefits of the programs are truly invaluable. The other day in our Spouse Breakfast meeting someone was talking about why he was there even though his wife successfully had her surgeries more than two years prior. He explained he was overcome by a wave of emotions when he saw someone wearing a pink hat. That may seem trivial to outsiders, but he knew he could talk it out in a safe space with a group of peers that could empathize. It just goes to show that anything can spark a rush of emotions, and it’s never too late to confront them. So, we’ll be here saving a seat for you, if the time feels right. As it is never too late to confront your emotions, it’s also never too long to confide in your peers and bond over your experiences. 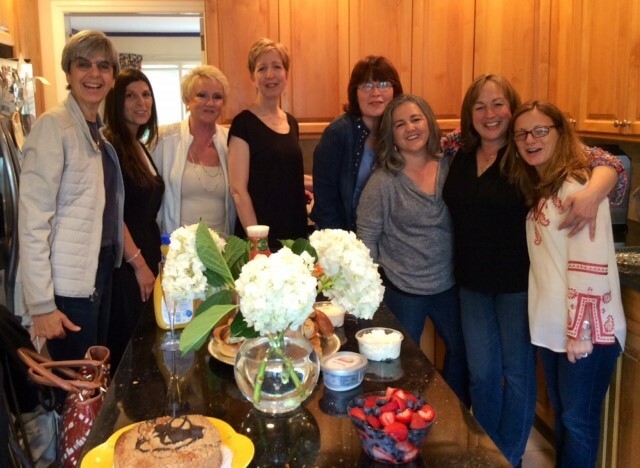 On Saturday, I was honored to be included in a special reunion for one of the first Sisterhood of Support groups I initiated at our practice more than six years ago. Many of these women continued to participate several years beyond their physical restoration to deal with the remaining emotional components and because of the incredible bond they formed. The power of this bond has remained with each of them and the strength of their connection transcends time. As each person arrived, the excitement and love was palpable and the ease of reconnecting evident as if time had stood still. The memories of trust, shared confidences, and intense feelings still preciously handled with care and openly discussed. There is much to be said about the Power of Sisterhood; creating an environment that allows women undergoing mastectomy and reconstruction to know they have a “Safe Room.” What relief to have the support of others, to share the swarm of thoughts and discover the commonality of those feelings, to feel reassured, to be assisted in seeing beyond the moment, to openly cry and laugh together, and to learn to be your own priority. Today, in a Sisterhood of Support group, one woman shared how her participation has assisted her. Just prior to beginning chemotherapy, she met someone in the group who was two weeks ahead of her in treatment. They have since texted every day and their connection has served to be grounding. It is difficult for those outside of this circle, to truly understand the complexity of feelings during treatment and thereafter. A positive group environment is critical to an individual’s healing. These are our “thrivers” — women who grow from their experience so that when they come upon a new dragon, they reach down deep and remember the strength within to confront a new foe. They will forever share this bond.